"Why you little!" is one of Homer's catchphrases. Most of the time it is followed by Homer strangling Bart for whatever reason, commonly being Bart insulting Homer verbally, but in the episode Homer's Phobia, Bart slapped Homer on account of seeing people hitting each other. There have been 19 variations of this catchphrase. In a couple of episodes Homer has said it when he is further away. 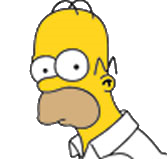 In Treehouse of Horror XIII one of Homer's clones tried to strangle the real Homer they both went 'Why you little' at the same time. Grampa sometimes uses it when he strangles Homer.